Adjustable and customizable shelving system. TightMesh shelving wires are spaced closer to prevent tip-overs and fall-throughs. 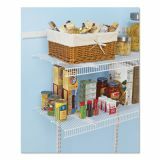 Rubbermaid FastTrack Pantry Kit, 4 Shelves, 17.187" x 2.875" x 49.25", White - FastTrack is an adjustable, easy-to-install shelving system with superior strength. The all steel rail and upright system is completely adjustable to help you build a durable solution to match your specific storage needs. Various shelving depths are available from 12"-20" deep to help you maximize your storage space. Ideal for pantries, laundry rooms, linen closets and utility rooms and gives you the safe, sturdy storage space you need to organize things like heavy food items, totes, laundry soap and more. FastTrack Rails are the key to an easy to install system. Install the rails, then hang uprights, add brackets and shelves to complete your closet shelving system. This all-in-one kit allows you to add a heavy-duty, 16" deep adjustable closet system to your home. 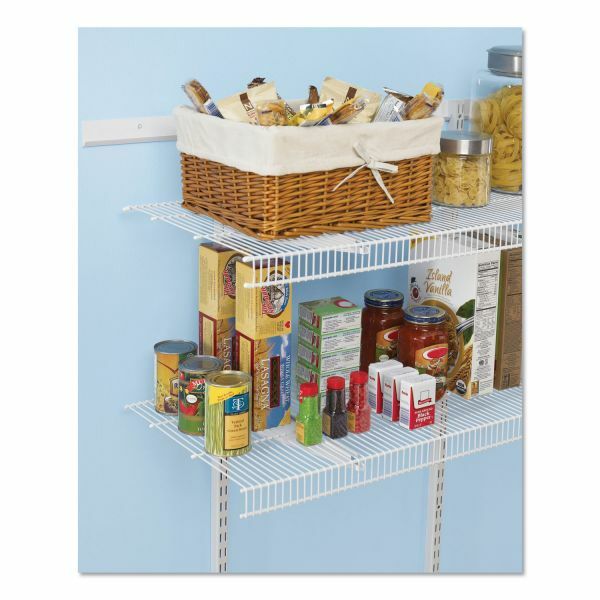 The kit includes Tight mesh shelving which prevents items from tipping over or falling between the wires making it perfect for the pantry, laundry room or utility room. Heavy-duty, extra deep TightMesh shelving supports bulky items. Sturdy steel construction reliably holds heavy, bulky items.